Last week I explained, in a Lesson to Ben Bernanke, why gold is rallying. This week, it kept on rallying, and I am know what they call a “happy camper”, because I played this perfectly (for perhaps the first time in a long time). Let’s walk through the happy story, shall we? PAA.TO – Pan American Silver Corp.
For example, on Tuesday I sold the June 46 call options on my G.TO – Goldcorp Inc. holdings for $1.20. Tuesday, you will recall, was the day after Monday, and Monday was a big up day for gold and gold stocks. Goldcorp was trading just shy of $47 when I covered, so I sold an option worth, say, 90 cents, for $1.20 (with the 30 cent difference being the time premium). Gold weakened, so on Thursday I was able to buy back those options for 39 cents. That’s a nice little profit for two days work. I did the same on my shares of K.TO – Kinross Gold Corp. as well; covered on Tuesday, and closed the position on Thursday. if the stocks increase, I’ll let my stocks be called. If I’m going to buy back an option that I’ve sold, I want to at least double my money. So, in the Goldcorp example, I sold the options for $1.20, so I would not buy them back for anything more than 60 cents (ignoring commissions). Since I bought them back for 39 cents, I was satisfied. Since I couldn’t get a similar deal on most of the other options, I haven’t bought them back, yet. If gold goes on a tear this week and I lose my stocks, so be it. The summer is a traditionally weak time for gold, so since I sold options at strike prices above market value at the time I sold them, and since I also got a premium, I’ll be satisfied with that result. My goal over the next month is to increase my cash position, so this is a way to do that. I won’t go into the specifics of how many contacts and underlying shares were involved, but obviously these were profitable trades. If you used the value of the underlying stocks as the capital base, the profit was just over 1% for one week’s work. If it was possible to do this every month, and the underlying stock never changed in price, the profit for the year would be around 12%, which is great for a basically risk free trade. Of course, real life isn’t like that. There is no such thing as a “risk free” trade. If the price of the underlying shares had dropped by 5%, a 1% return on the options isn’t a great investment. However, let’s review the original objective of the trade: I like gold stocks, and plan to hold them long term. I’m not smart enough to day trade them; I can’t pick the peaks and the troughs exactly. This way, I buy and hold the stocks I like, and “juice” my returns by selling options against the underlying stocks. If the stocks go down, I collect the premium. If they go up, I lose some of the upside. But, if the stock goes down after I cover it, and I can buy back the options at a lower price, and then the stock goes up, I get the best of both worlds! I get the benefit of the stock increasing, and I get some extra returns from the options. Perfect. 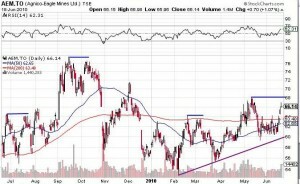 Here’s the chart for the past month of AEM.TO – Agnico-Eagle Mines Ltd. (click on the image to enlarge); I’ve marked with arrows the approximate place where I sold the calls, and then re-purchased them. Lucky, eh? Perhaps, but you don’t need to be a real genius to figure this out. June 8 was the third day of a nice advance for gold, and on June 8 there were less than 9 trading days left until options expiration. I decided that after three days of advances, it was unlikely that we would see another 9 days of strong gains. Yes, I got lucky on this one, since immediately after I covered the stock fell. But again, either way, I win. I covered and then closed, so I made pocketed the premium. However, if I hadn’t bought the options back, I could have bought them back at the close on Friday for $2.29. Since I sold them for 80 cents, I would have lost $1.49. 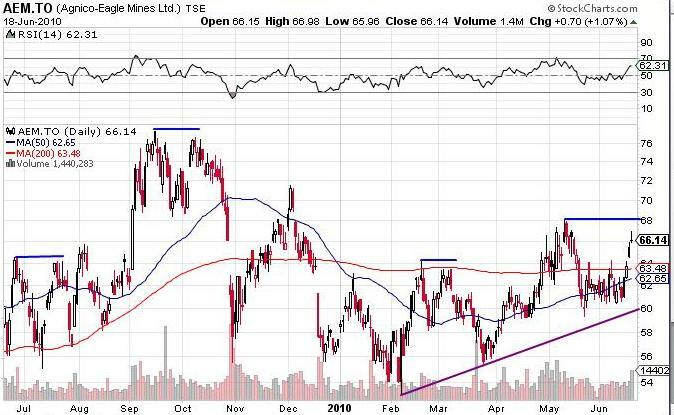 However, between June 8 and June 18 the price of AEM.TO – Agnico-Eagle Mines Ltd. went from $64 to $66, so even though I would have lost $1.49 on the options, I would be up $2 on the stock, so I’m still ahead. 1 Only cover after the stock is up for at least three days in a row. 2 Sell options with a strike price that is slightly higher than the current market price if possible. If you can get a decent premium on an option that is one or two dollars out of the money, even better. 3 Only sell current month options, ie. only sell options that will expire in four weeks or less. The goal is to use the depreciating value of options to your advantage; sell something that is rapidly depreciating, so you can buy it back for less in the future. I could generate a greater premium by selling an option with four months until expiration, but then I run the risk that the stock takes off to the upside during that time period. 4 Once the option is sold, place a “Buy to Close” order for 35% of the original price, good for two days. If the order is filled, you make a profit of 65% (excluding commissions) in two days. If the order isn’t filled, re-evaluate every two days. If the price of the stock drops, you may simply allow the options to expire worthless. If the price goes way up, wait until the final trading day of the month (the third Friday of the month), and buy back your options. You will lose money, but at least you pocket the time premium, and you still own the underlying stock. That’s the quick version. Obviously you can tighten up the rules better than this, but it’s a start. Feel free to post your thoughts here, or on the Buy High Sell Higher Forum. It would appear that gold had a great run this week. 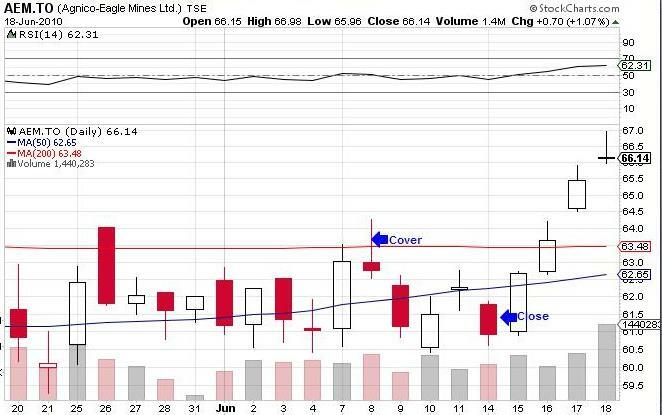 AEM, for example, was up four straight days, so an intermediate top is looking likely. Perhaps time to cover again? Since it’s now a full month until the July options expiration, I would only cover on Monday if gold is up again, and if I can get a decent price for options that are at least $2 out of the money, to compensate me for the time until expiration. So, since AEM closed at $66.14, I would probably be looking to sell the July 68 calls (which closed Friday in the $1.40 range). Ignoring commissions, if AEM stayed at $66.14 for the next month, the options would expire worthless, and I would keep the $1.40 premium, for a profit of 2% on my underlying capital. And, of course, I still own the stock. Gold was in a base building period between March 2008 and October 2009, where we had peaks at just under $1,050. 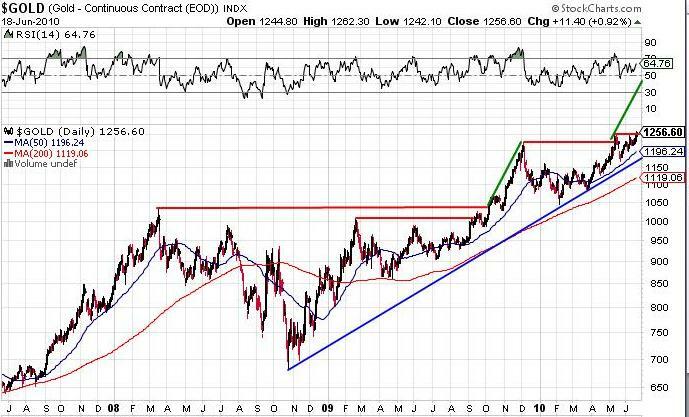 The between October and November, 2009 gold broke out, running up into the $1,200 range, before consolidating back until May of this year. Are we in another break-out? It would appear so. The last break out ran for two months and added about 15% to the price of gold. It would therefore not be surprising to see another 15% increase, from the $1,200 range, before the end of the summer, taking gold up to just under $1,400. Of course we could see a blow off run in the next ten days, taking gold up to the $1,350 range (which is the level I predicted gold would be at on June 30, 2010). I also predicted the Dow would be at 10,000 on June 30, which is possible if there is any further weakness between now and then. However, there is one problem with this scenario: Over the last few years, the worst month for gold is June. That’s not entirely surprising, since May is one of the best months, and June is the start of the summer, when most traders tend to lessen their trading efforts. July is a marginally positive month, and August is the second worst month of the year, which is followed by the traditionally strong September through February period. Obviously this year June has, so far, proven to be a great month, with gold reaching a new high. Does that mean the trends won’t repeat this year? Perhaps, or it could imply that we are in for an even weaker July. 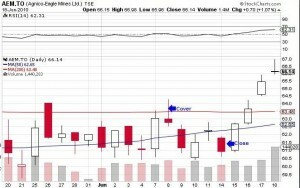 AEM.TO – Agnico-Eagle Mines Ltd. call option, I will probably take it. If AEM goes to $67.99 by the third Friday in July, my options expire worthless, the stock is up $1.85, and I keep the $1.40 premium. That’s a total of $3.25 profit, before commissions, or a 5% return in a month. Sounds good to me. If the share price pulls back, I’ve mitigated my losses. Makes sense either way. Second, I will continue to hold cash. Currently I’m 21% in cash, so obviously my returns have been helped with my over-allocation to gold stocks recently. If we do have the expected summer correction, I will look to deploy that cash on some bargains. So, in short, I’m holding out for some upside, but protecting myself against the downside. Right or wrong? You decide. Thanks for reading; more next week.